Lunar Rogue » Say Hello to Julia! I’m Julia, the lead singer and rhythm guitarist for Lunar Rogue. I also write the music. 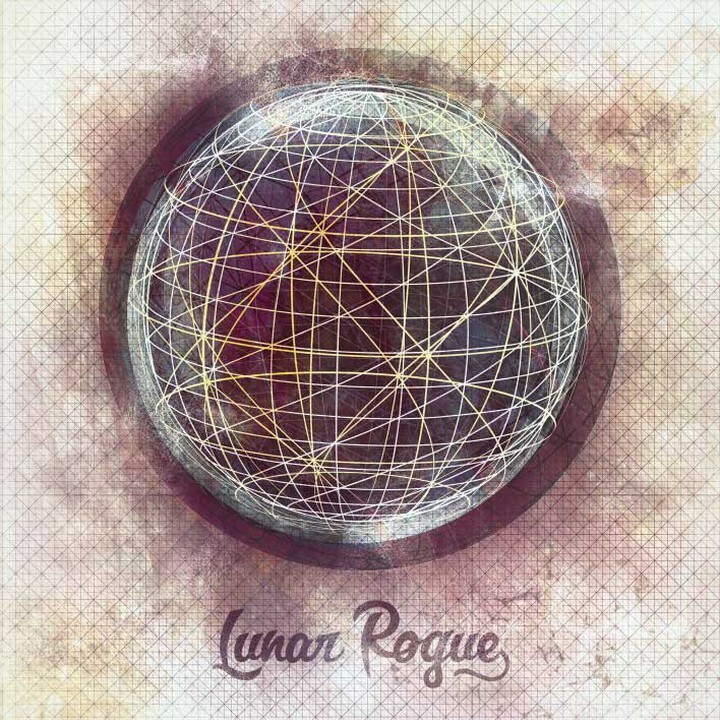 Lunar Rogue is basically my life. I grew up with music all around me. Although I’ve never had any formal training, it was inevitable that I would end up in the music field. Papa Rogue (my dad) is an awesome guitarist and singer and Mama Rogue (my mom) also has a beautiful singing voice (but she will never admit to that and, unless you sneak up on her, you’ll never get to hear her sing… it’s like catching lightning in a bottle! Hehe). I had a super awesome and supportive family growing up, so the sky was always the limit. I went through the acting phase, modeling phase, fashion designer phase, make-up artist phase, and several other phases. I even had a social worker phase… Whew! Dodged a big bullet there, huh?! I think my music phase might actually stick! Haha. I like to make things (creative things) like candles, clothes, cards, dream catchers, whatever I can think of! A good portion of our merchandise is hand made by yours truly. There’s something about creating that makes me happy. I guess this is why I write music, too. I feel awesome after completing a song. I feel even better when the song isn’t crappy!! Lol. My favorite thing to do is curl up on the couch with Deb and watch movies all day while eating bowl after bowl of her delicious chicken soup. It’s a rarity, because LR and everything else seem to keep me extremely busy. I have an amazing family I love to spend time with. I’m quite attached to my nephews and nieces, so Aunt Juju spends as much time with them as possible. When I’m not with them I’m typically with my LR family. I found the perfect group of musicians who have become more than band mates, more than friends, they’re family. It’s pretty great to know I can count on any one of them if I ever had to call on them for anything even unrelated to LR. I’ve been very lucky to find so many cool people to play music with. I still remain close with even my ex-Rogues. I can’t seem to stop buying guitars. So there are several guitars in my living room, my bedroom, and put away in cases being stored. 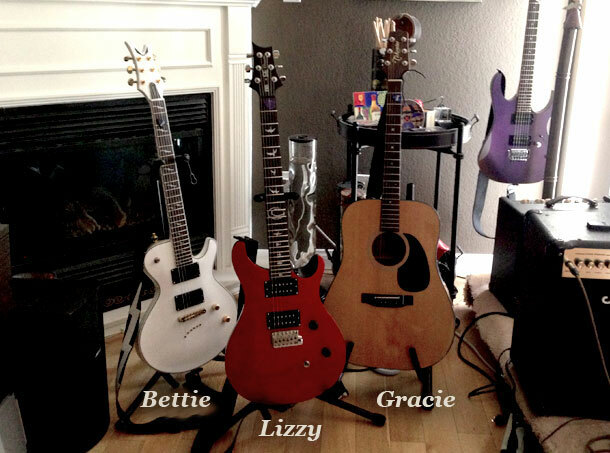 Lizzy, Gracie, and Bettie are the only guitars I play regularly, but the others do get playtime as well. I keep a couple of guitars at my sister’s house where I do a lot of my writing with my nephews, Wyatt (6) and Russell (3). They have been my little muses since I first started writing music. So yeah, I’m a sucker for sweet faces and beautiful guitars. I also have two incredibly beautiful (I’m not being biased, they’re seriously gorgeous) nieces, Lilli (3) and Annabelle (6 months), who inspire some writing. I’m also a sucker for cotton candy, Hot Tamales, black licorice, strawberry Twizzlers, Godiva, See’s (have you ever tried their marzipan??? YUM! ), and a whole lot of other sweets! If I could eat Chunky Monkey ice cream everyday without turning into an actual chunky monkey, I wouldn’t think twice! I love Christmas music and can listen to it anytime of the year. I played sports growing up. Softball was my #1 until halfway through high school. Then I played water polo. In college I became more interested in recording music and quickly realized it was much more fun to sing rather than run the board! Classic rock and oldies are by far my favorite genres, I like classic cars, I swear when people don’t use their turn signals, I love dogs, I still want to learn how to surf, heights sometimes make me nervous, I get really cranky when I haven’t eaten, I think all books should be available on CD so I can “read” while I drive, I don’t download music or movies because I like to have the physical copy in my hands so I can look at all of the artwork, I Love vintage Hollywood art/décor/etc, I’m very affectionate with people I’m close to, my favorite sounds are children’s laughter and a great vinyl record (like Fleetwood Mac’s “Rumours”) being played on an older record player with the built in speakers, I think disco balls are awesome, it makes me sad that reality shows have taken over TV (especially MTV), I used to volunteer at a homeless shelter and really want to go back, I love cooking and am not too bad at it (Mommy taught me the ways! ), I’m pretty sure Stevie Nicks is a goddess, I don’t walk under ladders, Christmas makes me excited because I have an excuse to give all of my loved ones gifts, I might be the only Colombian who doesn’t like coffee, I eat a spoonful of sugar to get rid of hiccups (which I tend to get a lot! ), and I love awesome people! So that’s a whole lot of useless knowledge about me! Oh, and I was born under a full moon and total lunar eclipse… That might give a little insight into how I named the band!